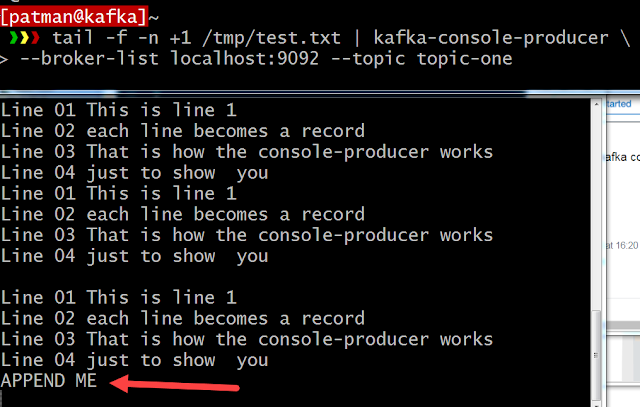 In this article I am going to be going over some quick explanation on how Kafka works and then go install it on an Ubuntu 16.04 Server and run a few basic commands to make sure it's working. First what is Kafka and why would I want it? Apache Kafka is an open-source stream processing platform developed by the Apache Software Foundation written in Scala and Java. The project aims to provide a unified, high-throughput, low-latency platform for handling real-time data feeds. Its storage layer is essentially a "massively scalable pub/sub message queue architected as a distributed transaction log," making it highly valuable for enterprise infrastructures to process streaming data. OK, fantastic what does that mean? But before you dive into that, let me go over a simple "How Kafka Works" example. In Kafka information is stored as a Record. A Record contains three pieces of information. Records are written sequentially to a Partition of a Topic. This image shows the anatomy of a Topic that contains a single Partition. As records come in they are appended to the end of the partition. This Forms an immutable sequence of records. If I add one more record to the above the new record would be appended to the end. This shows that the newly added record is added to the end. When a record is added to a partition it is given a sequential id number called the offset. In this case the newly added record has an offset number of 6. How long does a Record stay around? That depends. In the server.properties file there are a few settings that determine how long a record stays in a partition. There are the basic properties that set the retention rules for a record. The default settings is to remove a record if it is older than 168 hours (7 days). You can also set a byte size limit if you do when the size of the partition exceeds that size records will be removed from the front of the partition to get the total under the size. In this Topic with one partition 6 records have been written. The first two records where written on day 1 and the rest on day 5. Eight days later if we look at the partition we will see that the first two records have been removed. They were removed based on the log.retention.hours in the server settings. Everything 7 days or older is removed. When a consumer starts up it subscribes to a Topic. Although a new consumer can read every message in a topic it is more typical to subscribe to a topic and wait for new records to be sent to it. When a new record is added to the Topic it sends the new record to all Consumers attached to that Topic/Partition. In this example the Consumer a subscribed to this Topic after Record '4' was added. No records were sent to the Consumer until the next record, Record '5', was added to the topic. As long as this consumer is attached all records added to this Topic/Partition will be sent to it. 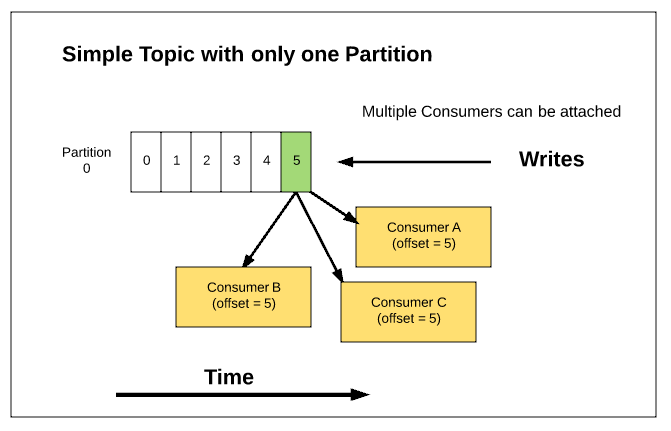 Multiple Consumers can be attached to the same Topic/Partition. OK now that gives us some basics. 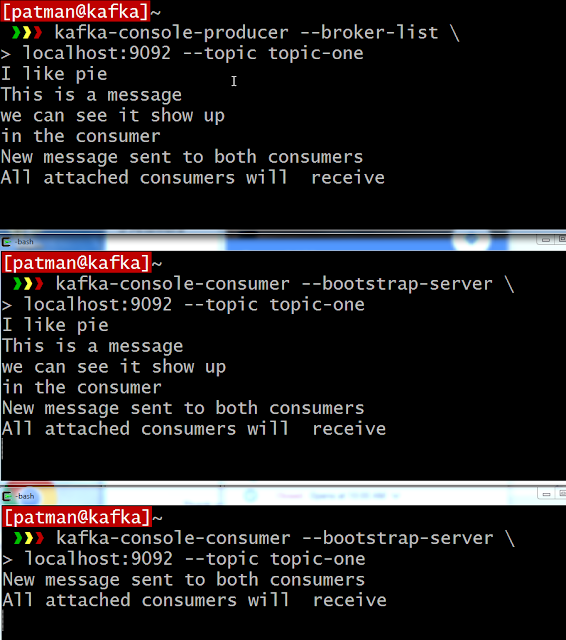 With that in mind I am going to install Kafka on Ubuntu 16.04 and do a few tests. I have a basic Ubuntu 16.04 server installed. You need Java installed on the machine and I prefer installing Oracles Java vs the OpenJDK. Run the following command to install it. Now we need to install Zookeeper. 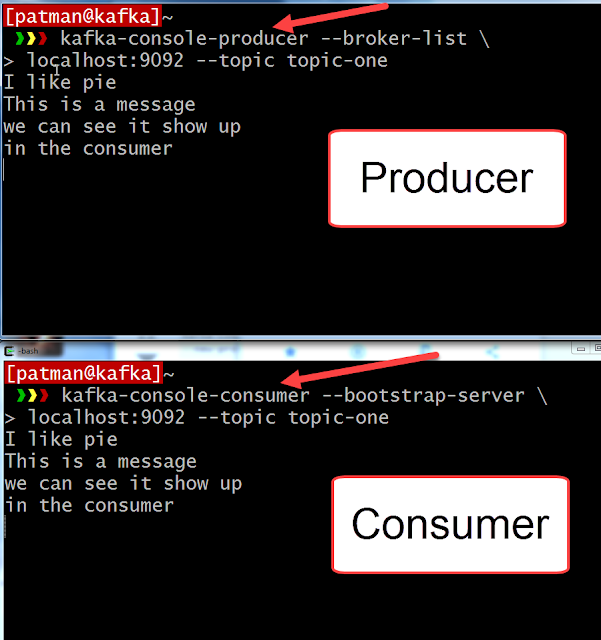 I am not a zookeeper guy… yet but it's needed for a Kafka install. This is the results you want. This is where I found the URL to download. Make a director for kafka and untar it. Try it out real quick to make sure it runs. 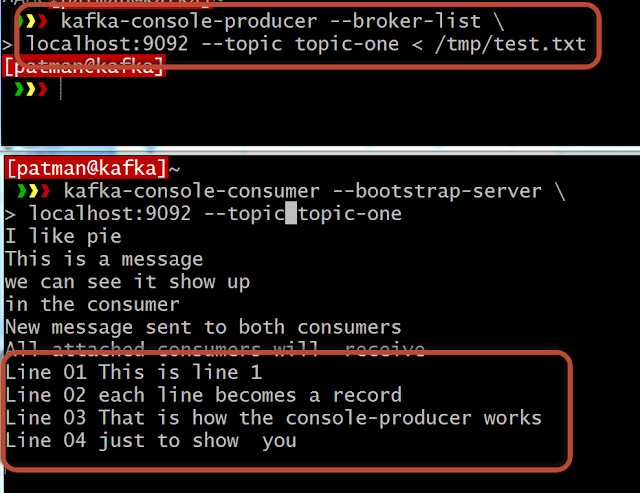 Leave it running and use the Kafka-console tools to talk to it. I am going to set up some simple scripts to make it simpler to run these command. 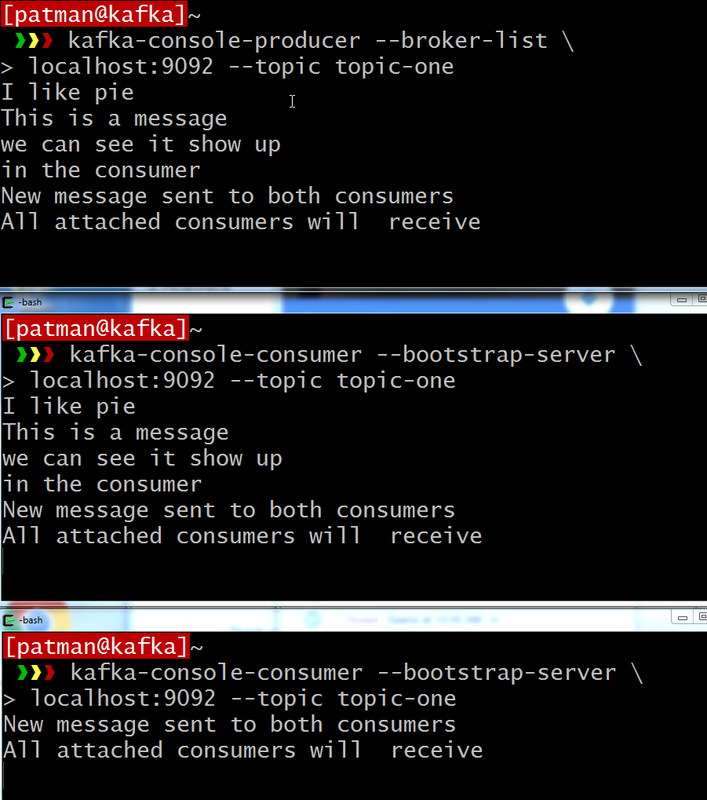 In Kafka you post messages to topics. Currently you have no topic set up. To prove this, run this command. For this simple example I will not go into multiple Partitions or Replication-factor. And now list all topics again. Now on the producer side type in some messages. Each time you hit return it will send the line you typed. Also you can feed it an entire file. Each line of the file becomes a record. That is the way the console-producer works. Or you can use this file to tail a file. Now just append to the /tmp/test.txt file and see its messages get sent. 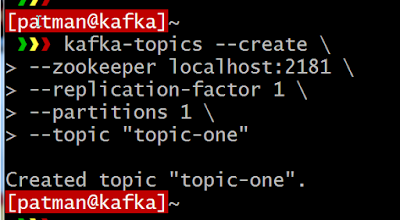 There you go a very basic overview on very basic Kafka Topic with one partition.